A commemoration is to be held in Cobh next Saturday (19th) to mark the centenary of the founding of the First Dáil Éireann / An Cheád Dáíl. The event will be held on Saturday, 19th January 2019 at 3.00pm at the Cobh 1916 Remembrance Garden on West View in the town. The ceremony is being organised by the Cobh 1916 Commemoration Committee. 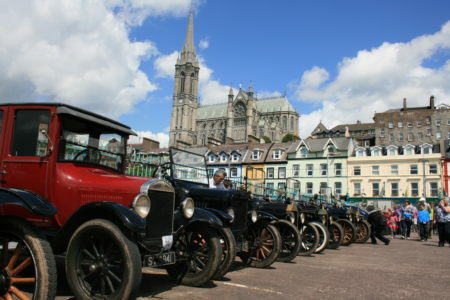 File photo of vintage cars in Cobh. No such large display is planned fro Saturday but there will be vintage wording. A spokesperson for the group said that it was important to mark the 100th anniversary of An Cheád Dáil as it created the parliament which the overwhelming majority of Irish people had voted for in the 1918 General Election. The Cobh 1916 Commemoration committee is non-party political and draws its members from a wide cross-section of the local community including historians, musicians, community activists and local business people.